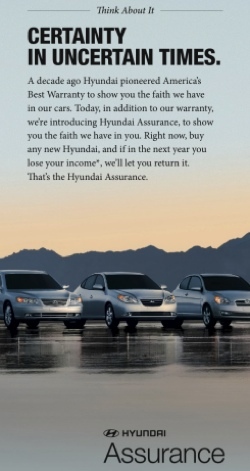 The Hyundai Assurance – Read the Fine Print! Hyundai’s new marketing program gives you the right to trade back your Hyundai if you get laid off within a year of purchase. I know this campaign is going to resonate quicker with consumers. More so than Chrysler’s “never pay more than $2.99 a gallon” one did. But before mainstream media starts writing story after story on how Hyundai is sympathetic towards laid off workers, etc., please read the fine print. “…They’re using trade in value. I used an 08 for comparison only because Kelley does not list an 09 yet. And as anyone knows, once a new car leaves the dealer it’s consider a year old. There you have it. It’s a nice idea, but if you’re in danger of losing your job, why would you be looking at purchasing a new car anyway?